In the first three days, tenants should flush the drinking water supply system twice a day (every morning and night for 15 minutes) on their own. Up till the end of the entire flushing procedure, before using water for drinking or cooking, run the tap every time for at least two minutes to flush metals or other substances that are accumulated in the system. If water has been standing in pipes for a long time, sediment may build up. Run the tap for at least two minutes after long periods of stagnation (for instance, after several hours or overnight) before using it for drinking or cooking. In the first week of the use of a newly installed water tap, regardless of the duration of stagnation, run the tap for at least two minutes before using it for drinking or cooking. As hot water increases the amount of impurities that may leach from pipes and fittings, avoid using water from hot water taps for drinking or cooking. Regularly clean household water taps and shower heads including any attached fixtures or fittings such as strainers. Both the outside of the tap and the inner part of the lip of the spout should also be cleaned. Regularly clean the water tap’s strainer or flow controller to remove accumulated particulate/debris. Do not leave items such as towels and dishcloths on the tap to dry to prevent possible contamination. Remove any residues left by cleaning products, soap, shampoo, hairspray or deodorants to prevent the growth of bacteria, mould and other microorganisms. Make sure the kitchen and bathroom are well ventilated as air-borne mould grows easily in damp areas. Repair dripping taps to prevent stain on bathtubs and basins. Strictly follow the manufacturer's instructions on the use and maintenance of domestic water filters/pour-through pitcher filters, including timely replacement of major parts, to prevent bacterial growth. Not all water filters can reduce the metal levels in water. Water filters certified by the U.S. National Sanitation Foundation (NSF) Standard 53 are among those recognised to be capable of reducing lead in water. An adequate amount of residual chlorine is maintained in water to keep it free from bacterial growth during its journey in the distribution system. This small amount of chlorine will dissipate when the water is boiled. To reduce the chlorine smell or taste, you can put a jug of tap water into the fridge. By so doing the chlorine will eventually evaporate. Cover the jug and use the water within 24 hours to prevent microorganism growth. The taste is due to the rubber or plastic materials used in the kettle seals, tap washer rings, washing machine and dishwasher hoses or other flexible hoses. Purchase approved connections for dishwashers and washing machines, which should include an approved single check valve. This will prevent water inside the flexible hoses, dishwasher or washing machine from returning to the drinking water tap or water main. Water in a plumbing system under pressure contains more dissolved air. When the pressure drops, the dissolved air in water will be released into the water body forming numerous air bubbles, making the water look milky. Run the tap for a moment or let the water stand in a container for a while. The water will become clear again as the air bubbles escape. When water supply resumes from a period of suspension, the sediments inside water mains may be stirred up, resulting in slightly higher turbidity in water. The Water Supplies Department would drain away the water through fire hydrants until its clarity resumes normal. If the situation persists, the Management Office of the premises should inspect their water tanks. If the water is found with high turbidity, the Management Office should drain the water tanks as soon as possible to allow intake of clear water. Carry out regular inspection and maintenance of the inside service. Clean and disinfect water storage tanks at least every three months. Select products from the Water Supplies Department’s General Acceptance (GA) list. Purchase taps/mixers with valid GA label provided by the Water Supplies Department. Use smartphones to retrieve more product information via the QR code on the GA label. Always appoint designated persons (e.g. licensed plumbers) to carry out plumbing works. All plumbing works using soldering for connecting copper pipes shall have the permission of the Water Authority and shall be carried out by a designated person. 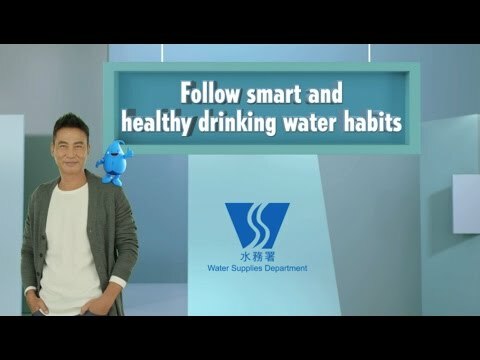 Fluoridation of water supply in Hong Kong has been implemented since 1961 in accordance with the advice of the Department of Health as a preventive measure to reduce dental decay in the community. In Hong Kong, treated water is soft in nature. It is left with a small amount of minerals and remains visually clear. Chlorine is used as a disinfecting agent in tap water, which may not be suitable for certain types of fish. Add dechlorinating agent into the water before using it for home aquarium. Minerals left in electric kettles are mainly calcium salts, trace amounts of which do not affect the water quality or body health. Simply use lemon juice to remove the minerals that have accumulated in electric kettles.